You might know Anna Kendrick from Pitch Perfect, or maybe you recall her role in Twilight, or perhaps you were even following her back when she was on Broadway. In 2016, actress and American sweetheart Anna Kendrick put pen to paper (or fingers to keyboard, more likely) to write her memoir Scrappy Little Nobody. Beginning with her early life growing up in Maine, Kendrick takes her readers through her life so far, up to the embarrassing culture shock of continuing to have little income despite major award nominations and what it’s like to work with everyone from Kristen Stewart to George Clooney. With surprising insights to her own personality, Kendrick surprises and delights in her first book. I can’t tell you how many hours I’ve spent scrolling through Facebook and YouTube watching interviews with Anna Kendrick. Jennifer Lawrence might be considered the queen of relatability by many, but Kendrick seems to take it even a step further with her seeming willingness to be open about her home life and general awkwardness. Her endearing personality, she reveals, is largely misleading, as her memoir describes and demonstrates. Although she often plays the hilarious and awkward introvert in interviews, Kendrick admits this is often an act because it works so well for her. However, is it an act of controlled awkwardness that covers real awkwardness? Kendrick doesn’t say, and this adds an unexpected layer to ponder throughout the work. Scrappy Little Nobody is fast-paced, despite the amount of time that passes throughout. Though earlier chapters describing her first acting jobs feel heavier than the remainder of the book (the remainder detailing her life once she gets into Hollywood circles, and, let’s be honest, the reason we’re all reading), her insight to working as a child actor and commuting between New York City and Maine provides an interesting look at how a child can both truly want to work as a professional actor and be overwhelmed by the task. Kendrick’s maturity is impressive in these anecdotes, which details an entirely other side many fans aren’t aware of. It bears mentioning that Kendrick’s recollections of working Twilight are the highlight of the book, if short-lived. Based on Robert Pattinson’s brutally honest discussions of his time on the films, Kendrick might be working extra hard here to maintain professionalism, but what she does reveal is teasing and full of unexpected pieces of information. Again, Kendrick’s descriptions of her work are insightful and thoughtful, injected with doses of humor that make these passages particularly enjoyable. Missing from her memoir is a full-circle moment. Although Kendrick focuses heavily on her relationship with her brother in earlier chapters — and the title of the book, in fact, is a reference to something he said to her — his presence nearly completely disappears after Kendrick gets to the West Coast. Kendrick is not obligated to divulge anything about her family life, naturally, but the influence her brother had in her childhood and her focus on it makes his lack of presence later feel unnatural. Why include those earlier moments if there’s little to know about the relationship now? Kendrick provides lots of detail about her childhood and quite a bit about her adult life, but her late teens and early twenties are more glossed-over. This is perhaps little seemed to be happening in her career at this time, but the minimal information here, too, feels unnatural. 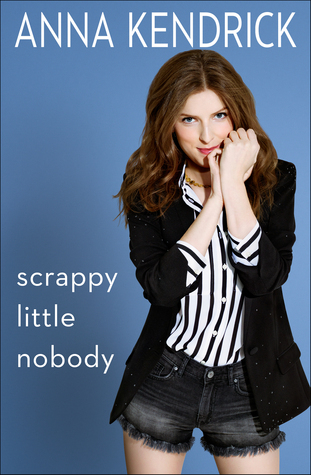 Perhaps leaving this off is to the book’s benefit, however: fundamentally, Scrappy Little Nobody is a fun and quick read for fans of celebrity memoirs and fans of Anna Kendrick. One of the more insightful and seemingly honest celebrity memoirs I’ve read, this one felt a touch more unique than others and absolutely worth the few hours I took with it.